The King's birthday is Jan. 8. Below are picks chosen by PRX editorial staff. You can see more pieces about Elvis Presley by using our search. Interviews from the Elvis archives, and new ones with Gordon Stoker of The Jordanaires (Elvis' backup singers) and Elvis friends (aka, Memphis Mafia) Jerry Schilling and Patty Parry. Produced by Paul Chuffo and Joshua Jackson of Joyride Media, for the Sony Elvis 75 project, which has more music and interviews. Also check Joyride's other Elvis hours: The Early Years, In Memphis, and He Touched Me- Elvis Gospel Music. From 1954, the second Sun Records release by Elvis Presley. Taken from the box Elvis 75 - Good Rockin' Tonight . Chuck Denault is a Police Officer for the small town of Kittery, Maine. He has two passions;: Serving the community he lives in and being the best possible Elvis Impersonator he can be. In April of 2003 the producer went for a squad car ride-along for some behind the scenes aspects of law enforcement and Elvis. 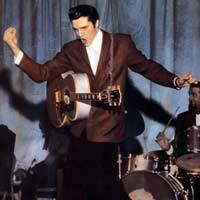 In August 1954 Elvis performed his brand new single on the Louisiana Hayride. Taken from the collection The Legend Begins. "Elvis Fans' Comments/Opening Riff" and "Elvis Fans' Comments III" from 1977 Elvis In Concert. Special Bonus Track on the 1982 collection Hitstory- The Story Continues. The singer expounds her biographical song "Elvis Presley Blues". Producer by David Schulman for MITOW series (site | NPR | PRX). 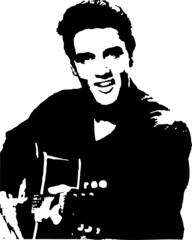 His on-stage intro to the song, 1977 Elvis In Concert. "Blue Suede Shoes" and the five-part allegorical "Baby King" story from the 1989 tribute, The King & Eye. Conversations with Elvis worshipers. pilgrims going to Graceland on Highway 40. From Dan Collison & Elizabeth Meister 1997 series Bus Stories. Elvis electronica from Tosca's 1989 Opera CD. On-stage impersonators mix with classical stringed instruments, from the Kronos compilation Released 1985-1995 / Unreleased, composed by Michael Daugherty. Norman, from Ocean City, Maryland, "sings like Elvis and all that". From "Closing Riff- Special Message From Elvis' Father", a track on Elvis In Concert. A 1978 song-poem found at UbuWeb's 365 Days Project. Mark Vidler mashes up an on-stage meltdown with music by The Farm, their song "Steppin' Stone". Mojo & Skid's Bo-Day-Shus!!! 1987 classic. Asia's Elvis fan club meets in Hong Kong. Elvis impersonators are an established part of Americana, one that usually gets little respect. But that hasn't stopped the King's fans in Asia from slipping into sequined jumpsuits and swiveling their hips on stage. Thousands of miles from Memphis, these guys can croon with the best of them. This piece drops in on a banquet and concert in Hong Kong where Asian Elvis fans gathered to see performances by impersonators from Japan, Malaysia, Hong Kong and the Philippines. This piece has not been broadcast. In this one hour radio special, you’ll hear live performances from Elvis’ MSG performances, and talk with band members James Burton and Glen Hardin, audience members, friends, and journalists who covered the shows.